This is an important Lost Ring Story as it was Lost Ring #1. 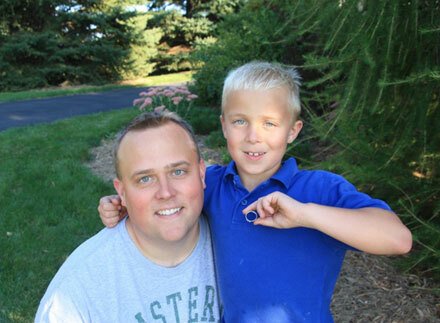 This is the ring that started it all (look how young both of us look in the picture, especially Carter). 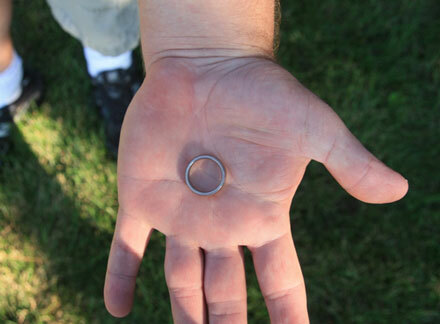 Prior to this lost ring hunt, we spent a majority of our time hunting parks and playgrounds looking for pocket change. A good day was when we found a quarter. Kinda funny now, when a good day now is defined by finding an $8,000 diamond engagement ring. This lost ring was before www.LostandFoundRing.com and before we had 99% of the equipment we have today. We were detecting with a couple hundred dollar metal detector and a garden shovel we “borrowed” from mom’s gardening bag. I saw a posting on www.Craigslist.com Lost and Found section looking for help in locating a lost ring. I reached out to the person, explaining that we had a metal detector and we could scan the area with the metal detector looking for the lost ring. After a couple of emails back and forth, we had set a time for the next night to go out and search. 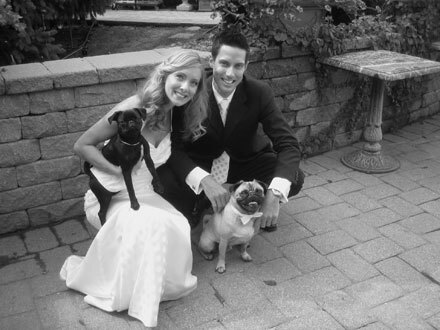 The couple, Brian and Robyn, were from Illinois but had made friends with the people whose property they were on when the ring was lost. Below is the story from a conversation with Robyn. Brian had been spectating the Ironman race the past weekend. After the race, he found a wooded area off of the route to change into some shorts. He then walked back to the race route, which ran directly past a rural house. Brian picked a spot in front of a driveway and encouraged others still running the race. Suddenly, Brian realized his white gold ring was missing. He retraced his steps back to the wooded area, searching for his ring along the way. He did not have any luck. He wasn’t sure if he lost it while changing in the woods, or while watching the race. It was getting dark, so Brian grabbed a flashlight and continued hunting for his lost ring. He searched for awhile longer, but did not find anything. Brian was so mad at himself for losing his ring. This is when Brian posted an ad on Craigslist hoping someone else had found it while watching the race. What were the chances? I responded to the ad offering to help. Robyn, Brian’s wife, replied back with a great image of a Google Map snapshot, including the area Brian was in circled in red. She indicated the main area to search for the lost ring was the driveway. My son and I made arrangements with the homeowner to stop out and search. The grass was longer than usual, so I could see how it would be hard to find the lost ring if it was dropped. After about 10 mins, all we had was $0.35 in change, a couple pop tops and a handful of other junk. Then, right in the area Robyn said to focus on, we got a strong hit on the metal detector … it was Brian’s ring! Someone must have stepped on it, possibly Brian while searching for it. It was about 1 inch underground, so made sense why Brian could not find it without a metal detector. I gave Brian a call to give him the good news, he was ecstatic. You could just tell the relief in his voice when I was talking with him. Robyn followed up the next week with a nice thank you and a reward check. We used the money to buy some new metal detecting equipment. Remember, if you know someone who has lost their ring outside in the yard, in the water, in the snow, in a volleyball court or at an Iron Man Race … tell them to give us a call! Doesn’t matter if it was yesterday, the week before or 10 years ago – we can find it. Please “Like” our Facebook page and you will get every Lost Ring Story delivered to you. Remember, every ring has a story, what’s yours?